The Fleur de Lis Fine Jewelry boasts a rich history, traversing all of Europe, beginning centuries ago. It is a design or symbol of heraldry, royalty, religion, politics, and many other realms and is found in coats of arms and flags in virtually every European country. In modern days it is a symbol used in military and sports as heraldic and artistic, appearing in logos and on uniforms in the United States and Canada as well as Europe. Because of its proud European heritage and diversity which reflects our beginnings, it was befitting for us to embrace it as our symbol of inspiration for our high quality, custom, jewelry business. At Fleur de Lis Fine Jewelry, our jewelry creations are designed and crafted with fine old European methods, combined with the latest technology, by New Yorks most talented jewelry artists. Their close attention to detail produces classic forms with signature uniqueness. This dedication to quality is what elevates us to a level high above the countless other Manhattan jewelers. We use only the best quality gemstones and gold in 14K, 18K and 22K as well as silver and platinum to create the perfect piece to quench every customer’s desire to own the best. To us, at Fleur de Lis Fine Jewelry is more than just body adornment. It is created to express a feeling, convey a message or reflect a mood. It can be used as a celebration in life for a special moment or a proud achievement. Our jewelers strive daily to create pieces that are unique and artistic, worthy enough to be worn by royalty but available to everyone with discriminating taste. Our artisans are eager to hear what you dream of wearing, then design and create it especially for you. Allow us to manifest your story, your feelings, and your desires into something breathtakingly beautiful that lasts forever. Jewelry can convey feelings and make many different statements. It can be either feminine of masculine. Jewelry can be worn for luck or to show prosperity. It may be given as a sign of love, romantic feelings or friendship. It may even be worn to promote good health, energy and sexuality. Whatever the reason for creation, we will bring it to pass in a timeless and elegant form reminiscent of the European Monarchs. Many people do not realize the symbolism in contrasts within a single piece of jewelry. 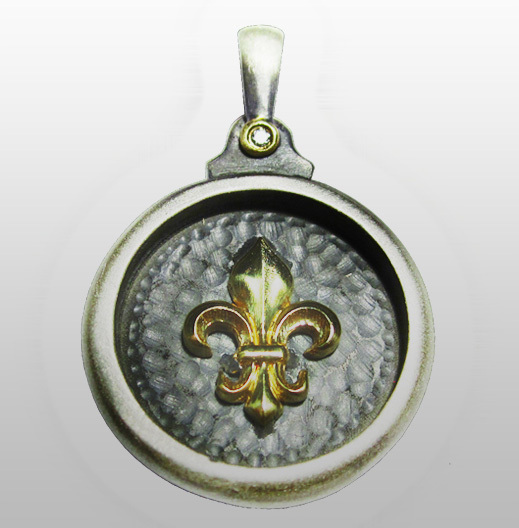 Educating our clients is a key part of the entire Fleur-de-Lis jewelry experience. The combination of gold and silver symbolizes the union between male and female. Black and white translates to positive and negative while polished and rough surfaces combine to depict the challenges and victories, or difficulties and luxuries, of life. Our staff is pleased to listen to your personal life story in detail in order to create the ideal piece specifically for you and no one else. At Fleur de Lis Fine Jewelry we do not simply sell jewelry; we create classic masterpieces in an ageless design. Visit our store and peruse our collection and get inspired. If you do not see exactly the piece that you have dreamed of, return again or convey your concept to one of our artisans. The ultimate satisfaction of our clients inspires us daily to create the epitome in classic jewelry design with the finest materials available. We truly look forward to serving you.